This file should be worked on, after #11 and #20 are completed. It also depends on the outcome of the markarth claim. This claim has high priority. I would like to see a Nordic farmstead here, in the same style as the ones I've added south of Markarth. 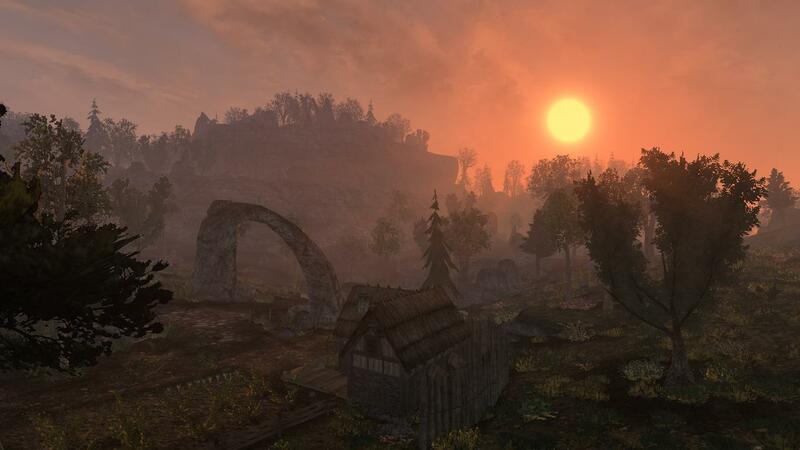 I view this land as a sort of fertile valley feeding Markarth along with the farmlands proper. But subject to raids from bandits hiding in Vorngad, so still retaining a rugged, fortified wilderness feelimg. Also, this claim won't be affected too much by changes in the Markarth claim. But I might need to usurp some cells from of #9, in order to make the cliff side of the river. After looking around the claim in its current state, I can say that there is little that still needs to be done, so let's finally get this finished for npcing. The rocks now used in the Midkarth Region do not exactly mirror what I had in mind for it when writing the initial region plan, but it looks great overall and probably we can just go with what we have now. After all, there has gone so much into this area by now and it's actually just great as it is. Likewise I'm dropping my idea of adding additional cliffs in this part. It should be sufficient, if the relatively bland area in #9 receives some detailling later. I'll add the farmstead as requested. I would like to remove some of the railing that frames the roads and change the horizontal road at the upper rim of claim 20 by removing most of the railing, closing terrain gaps and making it look slightly more interesting overall. That area has been bugging me for a while. There is one cave entrance in -102, 13 that was previously in an extremely well-hidden place and now after its position change I find it to be too exposed. I would like to shift this entrance back to the cliffside it was at first, only a bit more accessible than it used to be. The cave was designed to be a special find in this area, so it shouldn't be served on the plate as it now is. Lastly, I would like to address the complaints I had about the distribution of Orichalcum Ore and Widow Kiss Flowers. All of these sounds solid to me. Maybe in some places instead of orichalcum you can put some different ores? There's an iron mine just on the forest's outskirts, so at least some iron would make sense. We can aim for an image of rich in natural goods, but untamed and dangerous region for Vorndgad area. I know we are always redoing and upgrading our work and we should try to fight this trend, but today I had yet another thought. Road from Karthwasten with it's steps leading up to Karthgad is all nice, but it'd be kind of hard for wagons and horses generally to enter town that way. How about joining the path leading to Bear Clan barrow with the road going from Karthgad to Markarth? So a road would go at the feet of Karthgad's mesa, next to these wooden stairs? As far as I remember, terrain there is rather flat, so the road wouldn't look out of place. But if that would require too much work, then it's not worth a bother, I'd say. Edit: there's as well this texture seam, I believe the last I'm aware of, in need of fixing. Also, lots of detailing around that part of the road with Nelisse's wagon is included in the horse quest plugin - it was easier for me that way, since I spent many hours around this parts and I could immediatly detail any area needing it. That includes some orichalcum ores added to the cliff and around the arch, that should probably be removed by a reviewer. How about joining the path leading to Bear Clan barrow with the road going from Karthgad to Markarth? I would prefer to keep that path as it is currently. I can maybe put a small dirt path branch next to the cliffside Karthgad rests on that would allow easier passage for wagons. Here is an update with a couple of hopefully not too obvious texture seams at the road south of Karthgad but otherwise numerous improvements, I dare to say. So far I have already implemented my complete agenda for this file. Apart from this I have done a slight container plant-adjustment in the Aldkarth lowlands by switching the Bearclaws in this part for Persarines again, as I suggested in another place. That way we have two regions left for the Persarine to be found in (the other one being the upper part of the Druadach Highlands). I also added a bunch of Wither Wheats to the area. I haven't found a good way to make my red poppy idea work yet. In case of doubt, we can save ourselves this idea for later or just leave it. Please note that I have deleted many of the mushrooms growing in free open space, so that mushrooms are really remarkably more often found in the forest and caves or humid dark spots. This also helped to get the container plant amount per cell towards the 30 mark. As announced I also cut down on the orichalcum ore samples in the forest, mostly removing the ones that could be found at ground level when just walking by. Now you will have to search the rocky face of the clifftops to encounter this rare ore. I just don't want the Vorndgad Forest to be the main place for Orichalcum in the mod. Rather Orichalcum should be a general (if very rare) ore in The Reach apart from silver and iron ore. @berry: I removed the Orichalcum from the secret nord burial, I hope that's fine with you. I didn't really find a good place to spread around other ores yet. If you have any ideas for good spots, let me know. Actually, at this point I need you others to look at this file to point out errors and give feedback. Other than that this claim should be finished. What a fantastic file that is. I don't really have any criticism to add, everything looks great to me. We still need to add regions to this file and assign it to exterior cells aswell as apply the book-rescaling patch. I could take care of region assignment using the quickeditor, much easier than trying to do it in the CS. Many of the not-yet-included interiors can be found here. I downloaded all the "added" files from the old forum some months ago to save them. Though, if you apply the book rescaler on this file before adding them in, you will have to apply the book-rescaling patch on each single interior file later (before adding it in). The book-rescaler can be found here. Though, it can only be used as long as we have not moved to the new data files yet. It will look for all book instances added in the current file that have a certain id and rescale them by a factor of 1.17 (no matter if you have applied the patch previously, which will lead to outscaling them, if you apply it several times to the same file). Actually seeing these complications, I'm wondering in what order we should handle this all. Probably it would be best, if I tried to assemble our stuff, add in interiors, change ids according to our new naming scheme and keep a textfile at the side saying which interiors are still non-npced/non-patchgridded (+ apply the book rescaler where necessary). As I suggested some weeks ago, we can have one big testplay session instead of doing the classical review on all these interiors. The interiors from the previous forum should actually be good to go anyway. I really liked that farmstead. Initially I had some small irks about it, like where do the travellers put their horses safely etc. but if we follow this hyper-realistic path (where everything needs to make 100% sense and be 1:1 realistic) we will get nowhere, and it will differ a lot from vanilla. Another thing I thought was why is there no palisade towards the forest, from where I suspect bandits may come. But I must say I'm very pleased with how it looks, and it feels like a very cozy little home, where travellers heading to Markarth can get a good nights sleep within sight of the walls, before they well-rested and well-fed make the rest of the journey the next day. I'm glad to hear that you saved all the files, as I had some trouble in doing so. Can you perhaps send me the Karthwasten underground files? I have some on my computer, but it seems like they're not the most up to date ones. Me liking these changes. Feel free to adjust my stuff how you feel due, of course. Thanks for asking. On the matter of the farm, I agree about the palisade. I feel it'd look better if it surrounded entire farmstead. Another thing: since we want to redesign fields of this area, to make them more fps-friendly, I believe this small patch here is too crowded. How about replacing veggies with yet another row of wine (wine rows could actually be made more sparse too), or removing like a half of them? I'm not entirely sold on the hives too. Overall this place feels a tad overpacked to me. When I'm done with putting the Skyrim_Main-file together, I think it'd best if you had a go at changing palisades. I just can't imagine a full wall around this hovel looking any good. But perhaps you can make it work. Regarding this fields and fps, I think you are doing a misassumption regarding fps-impact. The grapes use transparency for their leaves, which factually has a far bigger impact on performance, even if the amount of geometry would be smaller than that of the small plants (the onions and leeks don't use transparency and should be relatively performance-friendly). I definitely agree about making fields smaller and less filled, but this field is absolutely within acceptable boundaries. Edit: I'll shift this to review now. You're right a full palisade would be a bit too much, but just some sort of fence or anything, and not all around the house, just here and there perhaps. Something like half burrowed palisade, like a high sharpended wooden fence actually could work here I think. 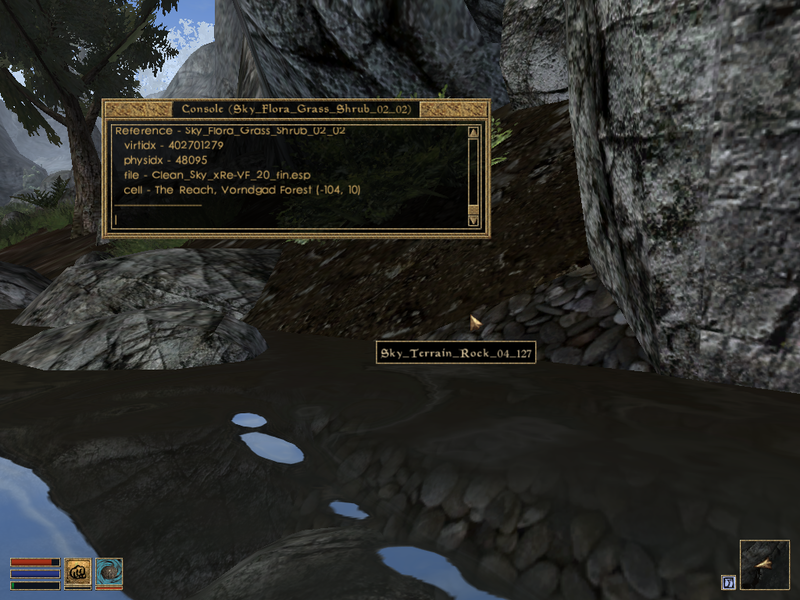 Or how about we employ vanilla Nord wall here, these one used around Karthwasten road, in Markarth and by wineries? I'll try these ideas later on. What I meant about the field is when we make bigger fields of Midkarth less crowded, to make things more optimised there, this one would look too cramped in comparision, especially given it's small size. I'm not actually worried about fps in this particular area, I'm sorry for not being clear about that. But really, that's a minor nitpick and an easy thing to adjust in the future. I agree this area turned out lovely. Using those stone walls could work. But plausible defensibility isn't really a concern in this game. See the imperial fortresses (counter-clock-wise spiral stairs), the ancient dunmer fortresses or really any town wall on Vvardenfell. I'm fine with spacing out the crops a little bit, although I don't think that it's really needed. When the Markarth and the area further east is finished we can get back and see if this field evokes the feeling of an inconsistent presentation and fix it then.